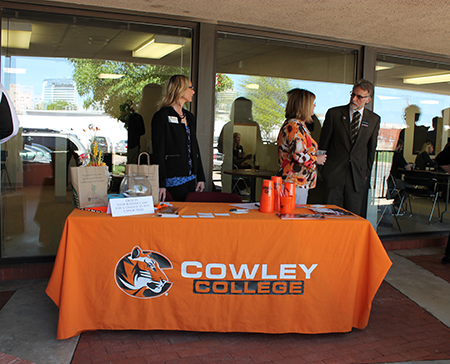 Cowley College recently hosted the Wichita Metro Chamber of Commerce Networking at Noon mixer at the school’s newest outreach center located at 532 S. Market in Downtown Wichita. More than 60 Wichita Metro Chamber of Commerce members participated in networking over the lunch hour while enjoying refreshments and hearty hors d’oeuvres. Dr. Harold “Doc” Arnett, Cowley College vice president of academic affairs, spoke on behalf of the college to highlight the programs and services offered at the Downtown Wichita location, and thanked the members for attending. Participants learned additional facts about Cowley from an informative kiosk presentation, and eagerly vied for door prizes, such as concert tickets and “goodie” bags. A few of the attendees were Cowley alumni, and expressed great pride in the college’s new presence in Downtown Wichita. Stimulating discussions, networking, great food and drink, and beautiful weather, made for a very successful event.